Here is the second story addition to the chicken coop that I worked on all weekend. I’m afraid the carpentry is all very rough by even a moderate craftman’s standards, but I don’t have much time available and eggs are a-coming! 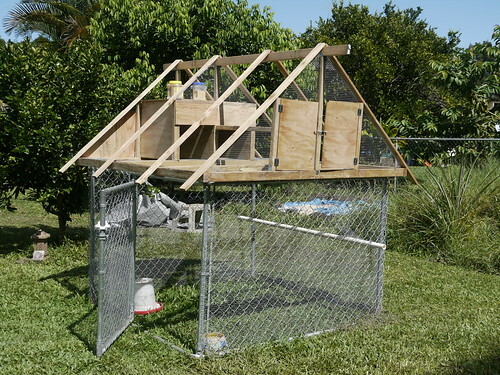 The 6x6x4 “security-enhanced” dog kennel is below. In this area they can hop around and feed in the morning while waiting for one of us to get up and let them out for the day. The top is a basic A-frame design. 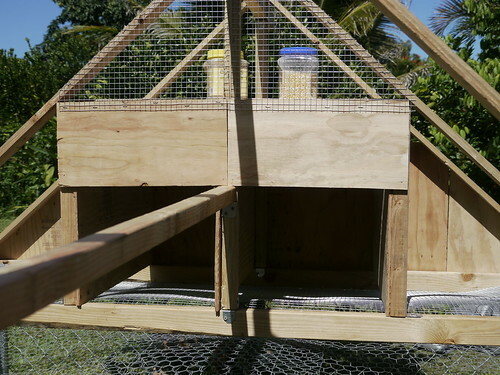 The 2/3rds on the right is a roosting area, while the left 3rd is divided into four good-sized nesting boxes (the roof line makes two boxes out of the empty spaces on the ends. 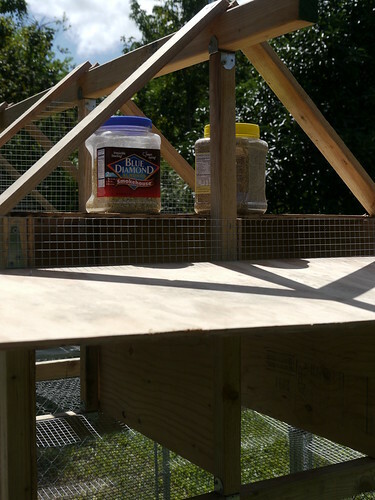 I hear that chickens often will share nesting boxes, so I didn’t want to build too many. I can always add some more on the right if necessary. The floor is mesh, to allow the droppings to simply fall through or be washed through into the grass with a hose. Access to the main area is through the double doors on the right, and a large lifting panel on the left that exposes the eggs. The mesh on the floor of the nest boxes slopes down from the interior to the egg access flap, and also from the sides to the middle. Hopefully the eggs will roll towards the back as intended. I plan to line the boxes with some closed cell foam, which is easy to spray clean and hopefully less messy and less work than moving straw in and out as I am doing now. Chicken access is via a hole in the floor mesh near the double doors. I have to build a nice little ramp for them. The roofing will be done next weekend, time permitting. I’m planning to use plastic roofing to save weight, plus a roof cap. Right now the top can be lifted by two adults with moderate effort. Unless I put wheels on it, we still need to be able to move it from time to time as the chickens are hard on the grass. The grass recovers nicely due to all the droppings, but they are just constantly pecking and scratching the ground.